Designed to enable bluetooth audio streaming from a compatible Apple, Android, Windows, BlackBerry or other Bluetooth compatible media device directly to the FUSION 700 series and MS-RA205 marine stereos. 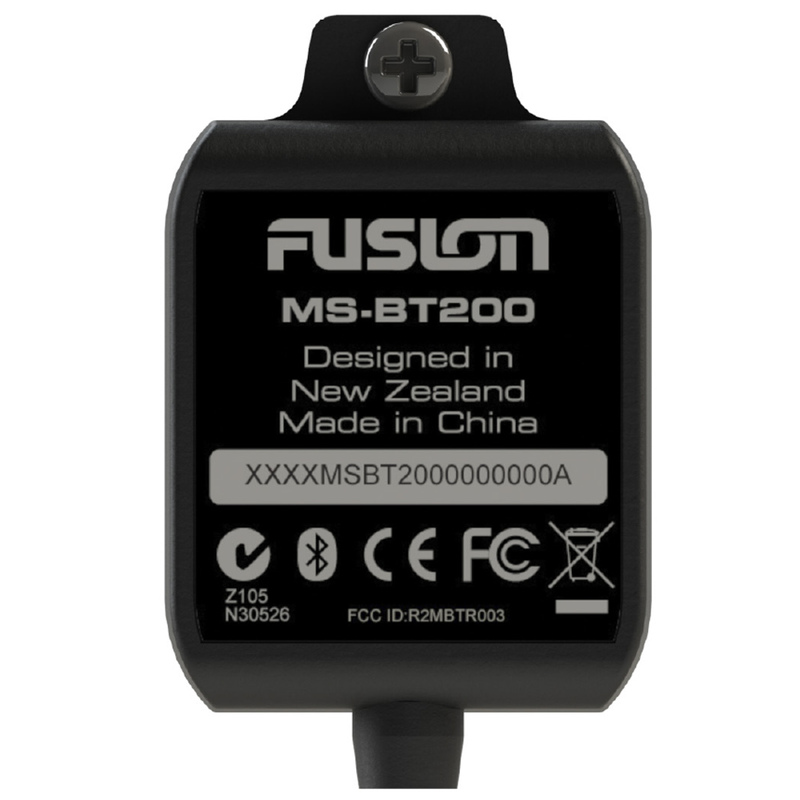 The MS-BT200 supports both FUSION stereo control and Media Device Control (software upgrade is required for your FUSION stereo - visit www.fusionelectronics.com for the update). Whether you have an iPhone, Android or Windows smartphone you can enjoy your favourite audio tracks through FUSION's award winning marine entertainment systems. Stereo Control Includes - play, pause, back and next, while the Data Display previews song name, artist name, album name (if available), song duration and elapsed time on the screen of your FUSION marine stereo or FUSION-Link certified Multi-Function Display. If you're on the move or relaxing on the deck, simply reach into your pocket for direct Media Device Control of the audio experience from your compatible device. Designed with the marine environment in mind, the MS-BT200 boasts International IP65 waterresistant rating to protect against the harsh marine environment. Simply connect the MS-BT200 to the satellite radio socket on the rear of your marine stereo for instant Bluetooth functionality (refer to user manual for pairing instructions). Note: If the satellite radio socket is currently in use, please purchase the MS-BT100 which will provide bluetooth connectivity via the AUX input of your FUSION Marine stereo. The MS-BT200 has an effective range of 33 ft, so whether you're on the deck or at the helm enjoy uninterrupted audio streaming.